Want a restaurant quality dinner in the comfort of your own home? Try making these pasta shells with bacon, squash, and sage. 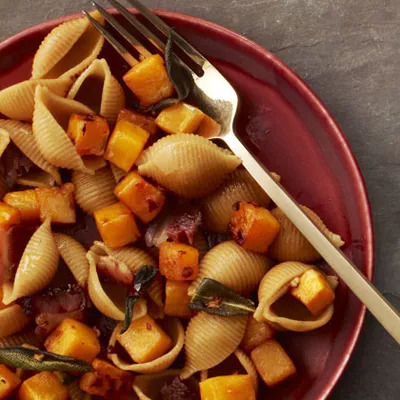 Sweet squash, salty bacon, and spicy sage pair together beautifully here, while also providing a healthy balance of protein, veggies, and carbs. Added bonus? If you strategically order your cooking steps, this pasta dish can be made in 30 minutes flat. Since it will take the longest to cook, start with the squash (or prep beforehand) by cutting it into one-half inch cubes and roasting in the oven for 20 minutes. Next, fry up the bacon in a large skillet and bring water to a boil for the pasta, which should be cooked al dente. As a last step, remove the bacon drippings from the skillet and add in sage, crushed red pepper, the roasted squash, and your pasta shells. Voila! A dinner that’s rich enough to satisfy a hankering for sophisticated fare, yet easy enough to throw together on the fly.